Dispatch from the Field (5-2-12) How do they do that? There have been many comments about our updates and how we can accomplish this from someplace as remote at Mt. Everest. The secret is satellites. The entire expedition is using two satellite phone configurations that provide data transmition called BGAN (Broadband Global Area Network). They're supplied by the Satellite Phone Store. Now it's not quite as fast as your home broadband system, but what can you expect from over 17,000 feet! 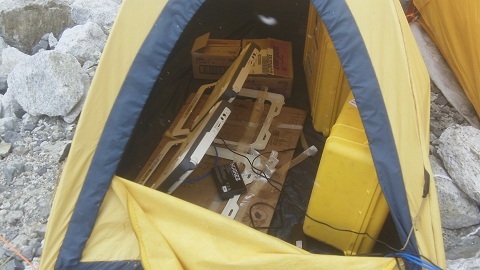 Here's a look at the two "magic" boxes, that allow us to keep all of you informed of what's going on with our Everest team (they have their own tent). What makes the BGAN so desirable is the portability. You can see that they're roughly the size of the laptops that they're supplying an internet signal to. So they're excellent for transporting into remote areas.